Plenitud hosts Service-Learning Trips with college, university, and private groups looking to learn about sustainability, permaculture, and healthful living while having unforgettable hands-on experiences. Together with our partners we create trips that provide unique service opportunities for students and faculty in the rural community of Las Marias, Puerto Rico. Students and faculty learn about a wide variety of topics while camping in the beautiful tropical environment of the Plenitud Farm & Teaching Center. Typically, these trips last from 3 days to 2 weeks. Participants engage in direct service learning at the Teaching Center and with community outreach partners in the area. Participants work hard, serve the community, receive training in permaculture and other sustainable practices, enjoy world class vegetarian meals, and go on fun adventures from river hikes and beach trips to cultural experiences in dancing and cuisine. We strive to build long-lasting partnerships with groups, and as a result we have established yearly service trips with George Washington University, Northeastern University, University of Massachusetts, and Loyola Marymount University, among others. We have also worked with middle schools, high schools, churches, and service/volunteer vacation organizations from across the U.S. Service-Learning participants return home as ambassadors of Plenitud and well-acquainted with sustainable lifestyles, inspiring others to live more healthful lives focused on meaningful relationships and being in harmony with the environment. We also host Service Learning Weekends for local school, church, and private groups. We offer a safe, beautiful space in nature where your group can bond through service, eating wholesome meals and relaxing together. Service Learning Weekends are Friday - Sunday and include meals (Friday dinner, 3x meals Saturday, Sunday breakfast) and campsite lodging, with a cost of $60/person. Participants provide their own tents and gear. We would love to work with you and host your upcoming Service-Learning Trip. Please contact us today to learn more about our customizable trip options for your group. To get a sense of the trips, please scroll down for an example trip itinerary and to view videos created by Plenitud alumni. 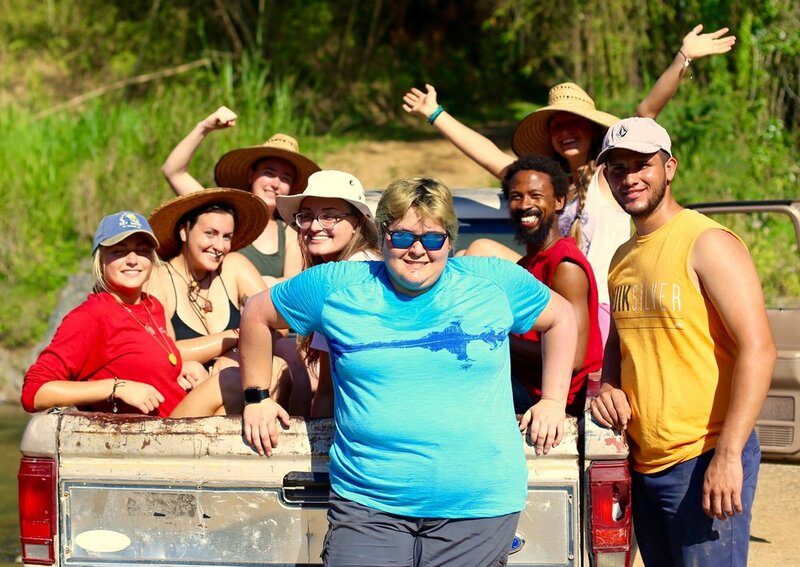 Every year, students from universities throughout the US visit Plenitud's teaching center and demonstration farm in Las Marias, Puerto Rico for a week of hands-on training, community service, and cultural immersion. Students from George Washing University have been committed to helping Plenitud in its efforts to promote sustainable agriculture and impact at-risk youth since 2010. 3:00-­4:00 – Sharing Circle with Rebecka about Agro-­ecology in P.R. 1:00-­ 5:00 – Relax at the Beach!